Who East Who in the Antarctic? Who Eats Who in the Antarctic? terms used in this module, their meanings, and their importance. basis of what they eat:  herbivores, carnivores, omnivores, and scavengers. the soil. Decay bacteria and non-green plants are examples of decomposers. A food chain shows how energy is passed from one organism to another. carnivore. The top carnivore is usually not eaten by another organism. process (basic chemicals) are then returned to the air, soil, and water. sunlight to produce food. This food forms the basis of a food chains. When a food chain is broken, the flow of energy is interrupted. A food pyramid illustrates the distribution of energy in a community. omnivores. The number of organisms decreases as you up the food pyramid. available to producers until the animal dies or produces waste products. chains that share some of the same organisms. handout and distribute it to your students. 1-The student will know some of the life forms found in the Antarctic. krill, and diatoms feed on. food chains, and food pyramids. Pencil or pen, paper, string. 1-List all the life forms that live around or on Antarctica. 2-Describe what a food web or food chain is. pond, wooded area, field, garden, yard). Lives There?" These handouts can be used by students as references. Does it Work?" and "Antarctic Waters: Who Lives There?" WHO EATS WHO? HOW DOES IT WORK? caught and eaten is the prey. Decomposers use the wastes and remains of producers and consumers for food. bacteria and fungi are examples of decomposers. relationship is called a food chain. animals that eats both plants and animals. -Sun, grass, cow, human, mosquito. -Sun, grass, mouse, snake, hawk. -Sun, seeds, rat, cat, flea. -Sun, seed, insect, turtle, raccoon, mountain lion. -Sun, leaves, deer, wolf, vulture, mite. -Sun, algae, shrimp, small fish, tuna, human. need for themselves to grow and reproduce. they need to eat many producers. food chains is called a food web. ANTARCTIC WATERS:  WHO LIVES THERE? the producers for the whole Antarctic community. -Plankton and algae are the base for the Antarctic food pyramid. -Small (1cm to 15cm) red, shrimp-like creatures. -Looks like a crayfish without the front claws. -Sometimes found in groups called swarms. -There are about 100 species of fish found in the waters off Antarctica. -Very small fish may feed on the plankton and algae. -Most feed on krill and on each other. -There are many species (30-40) found in Antarctic waters. -Sometimes found in groups called shoals. -Is a food source for many larger animals. -Feeds on small fish and krill. -A flightless bird, "wings" adapted to be effective paddles for swimming. -Have no predators on land. -Is preyed on by leopard seals and killer whales. 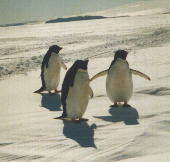 -Six types are found in Antarctica including the Emperor and Adelie. -A large variety of birds visit the Antarctic region. -Many of the seabirds also feed on fish, squid, and krill. -Along with whales are the most significant food consumers. -Is preyed upon by the killer whale. -Feeds on penguins, young crabeater seals, fish, squid, krill. -Is preyed upon by killer whales, and when young, leopard seals. -Feeds on krill not crabs; has unusual teeth which are effective strainers. -Is the most abundant seal in the world. -It feeds mostly on cod and silverfish. -Is preyed upon by killer whales and when young, leopard seals. Antarctic bases (killed to feed sled dogs). -Very deep diver, can stay submerged for up to an hour and a half. -Largest animal found on earth. -Feeds on krill which it strains through its baleen. -Only natural predator is the killer whale. -Man has killed so many that it has brought them close to extinction. -Feeds on fish and squid. -Is occasionally preyed upon by the killer whale. -Deep diver, using echolocation to find prey in dark deep waters. -Feeds on seals, penguins, fish, and occasionally other whales. lichen, fungi, and fresh-water algae. -Plant life survives on exposed patches of ground during the summer. -Bacteria and fungi are the main decomposers. -The largest group of animals are the insects (mites and ticks). -Largest animal is the wingless flying measuring one-half an inch. WHO'S WHO IN THE ANTARCTIC? that best describes how that organisms gets its food. 1-Of the four columns, which one are all the rest dependent on? Why? 2-Of the four columns, which one are the others least dependent on? Why? 3-What is one way that organisms in a community depend on each other? will take the organisms from that activity and put them into food chains. This will allow you to become familiar with the Antarctic food chains. Pencil, paper, completed copy of Activity 1.
organisms or just write their names. 1-What patterns do you see in the food chains? you made actually occur in the Antarctic? (remember the food pyramids). 3-Can you think of a food chain where you live? Write it down or draw it. need two cards per organism. organisms may be drawn or cut out and then attached to the top of the card. another "eaten by". Fill in the columns with the appropriate organisms. "eats". Make cards for the organisms listed in the "eats" and "eaten by"
columns. Remember to make two cards for each organism. of the cards face down on the table. the base card is placed to the right. Data Table:  Food chain lists from number six in the procedure. 1-Which organisms in your card deck are herbivores? 2-Which organisms in your card deck are carnivores? 3-Which organism in your card are omnivores or scavengers? 4-What are some of the predator/prey relationships? 5-What is being passed from one organism to another in the food chain? WHO'S CAUGHT IN THE FOOD WEB? Pencils or pens, paper, pins or tape, string. be. Have the student put the name tag on so it can be clearly seen. 3-Pass a string from each organism (student) to each of its source of food. connected by a string to every other organism that is uses for food. 4-Draw the food web you've created in the data table. 1-What organisms are the most important to the food web? How can you tell? 2-If you pull the krill out of the food web, what happens? 3-If you pull the killer whale out of the food web, what happens? and not in other places?